Hong Kong director, Dante Lam’s (林超賢), action film Operation Red Sea <紅海行動>, co-produced by mainland production company Bona Film Group (博納影) and Hong Kong company Emperor Motion Pictures (英皇電影), has been selected to compete as Hong Kong’s representative in the Best Foreign Language Film category at the 91st Academy Awards. However, news of the selection ignited criticisms from netizens. The plot in Operation Red Sea was adapted from the real event of the Chinese Navy’s evacuation of Yemen in 2015. The storyline focused on an event that happened in China, the starring actors were from the mainland, and the film was spoken in Mandarin. The only Hong Kong actor was Simon Yam (任達華), who had a guest appearance in the film. Netizens expressed the film’s cast and storyline had no relation to Hong Kong. However, the film did have some Hong Kong representatives working from behind the scenes, aside from Dante Lam, whose film To The Fore <破風> was also previously nominated for the award. Attached to the film was producer Candy Leung (梁鳳英), screenwriter Eric Lin (林明傑), who was one of the four screenwriters, and Elliot Leung (梁皓一) and Edmond Fung (馮遠文) who worked on the soundtrack. 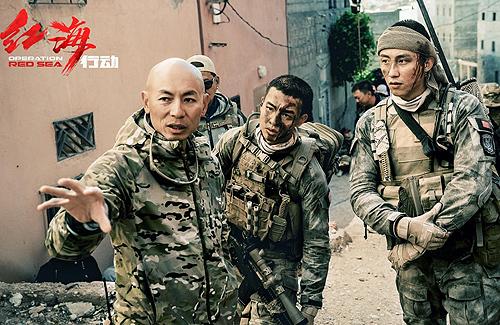 Even so, netizens argued Operation Red Sea does not have the characteristic of a Hong Kong film, and it does not deserve to represent Hong Kong. Others questioned the Federation of Motion Film Producers of Hong Kong, which was the organization that submitted the film to compete in the Oscars category. Despite the negative criticism, Dante Lam said his film’s selection to represent Hong Kong in the Best Foreign Language Film Oscars category is a huge honor and a great encouragement, no matter the results. “I didn’t expect Operation Red Sea, an action movie with a lot of commercial elements to be selected to represent Hong Kong,” he said. The film will be in the running against Japanese film Shoplifters <小偷家族>, Mexico’s representation ROMA, and Taiwan’s The Great Buddha <大佛普拉斯>. “I have seen Shoplifters, the movie represents people from all over the world and from all walks of life; it may be more in line with the taste of the Oscars,” Dante lamented. The film won’t even make it into the selection anyway.